Good Morning!! I was just over at House of Collums for her coupons and coffee and I read her post about the below coupon. This printable coupon has been reported to Cents Off (The Coupon Information Corporation) as counterfeit. Therefore, if you have this in your stash of coupons, destroy it! Chances are that if you do try to use this coupon, it WILL beep at the register. Apparently, the original online printable was legitimate, but because some Coupon Deviant has made LOTS of copies and/or emailed them around, all of them have been pulled. This is just another case of somebody taking a good thing and ruining it for all of us!! PLEASE KEEP IN MIND: It doesn’t matter, at this point, if the coupon you have in your possession is legitimate or not. The CIC has “red flagged” this coupon as Counterfeit; therefore, no store is going to accept this because they will NOT be reimbursed. For more information about Cents Off or to see their complete list of coupon fraud, click to view the list. Want to check to see if your printable coupons is legit? 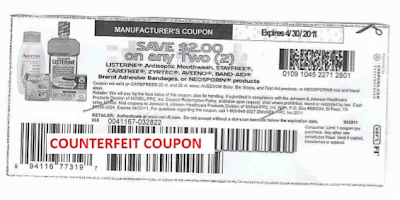 It's easy to check for product, value, and expiration date on every legitimate Coupons, Inc. coupon. Just click to visit Coupons, Inc. (Coupon Resource Center). Just enter the unique code printed on your coupon and you can instantly Veri-Fi it. *This only works with coupons that were produced by Coupons, Inc. I definitely need to coupon more... Heading over there now! I've got some groceries to pick up tonight. I had printed this one off legitimately and almost used it Saturday night...geez! I did not know that about coupons.com -- and I may not remember it tomorrow -- but that is neat. Thank you for that tip. I love the internet, it is a great way to gleen information. I had not idea there were counterfeit coupons or a place to find out if the ones you are using are. Thanks for the info. Thanks for plugging House of Collums and passing on the info about the fake coupons.